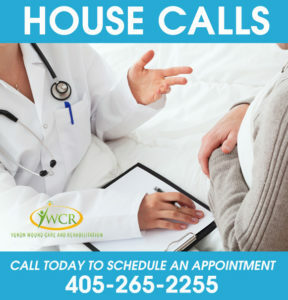 Yukon Wound Care & Rehabilitation (YWCR) is a privately owned therapy clinic located in Yukon, OK. We are conveniently located just west of the OKC metro, minutes away from Integris Canadian Valley Hospital and easily accessible from Oklahoma City, Mustang, Piedmont, El Reno and surrounding areas. Yukon Wound Care and Rehabilitation is an evidence-based practice; which means we provide conscientious, explicit and judicious use of the ‘current, best evidence’ in making decisions about the care of individual patients. Our staff has a true desire to provide excellent customer service & world class therapeutic care! With over 75 years’ combined experience, we have the knowledge and flexibility to give you the care you deserve, to get the results you want! Services provided: Wound Care, Physical Therapy, Ostomy Care, Gait Training, Fall Recovery, Lymphedema Management, Surgical Rehab, Women’s Health, Weight Loss, Pediatric Care & Vestibular Rehab. Appointments can be booked by ‘self-referral’ or as referred by your primary care/urgent care provider, surgeon, chiropractor or specialist. We see ‘all ages’ and self-referral patients can be seen for up to thirty days without a prescription. Same-day appointments are available for acute pain and wound care; please call for booking today! About your appointment: Registration paperwork is available on-line and can be completed ahead if desired. Please bring ID, insurance cards, medication list and any images (X-Ray, MRI, etc.) available. Wear loose fitting clothing if able and allow approximately 45 minutes for your appointment. Co-pays, co-insurance & deductibles are due at time of service and follow-up appointments can be scheduled up to 30 days in advance. We accept most major insurances. Discounted rates are available for patients without insurance or for patients who choose not to use their insurance due to high co-pays, deductibles, etc. Pay plans are also available! MISSION STATEMENT: To provide the results you want and the care you deserve! deliver world class therapeutic care!